Added support for Back to the Future: The Game (30th Anniversary Edition), PS4 version only! Fixed D3DTX-to-DDS QuickBMS scripts so that file size is applied properly, whoops! This MaxScript set is the result of a year's worth of work. Well, not completely, I started working on this back in July 2013, left it for a few months in half-complete state and just recently finished it up. 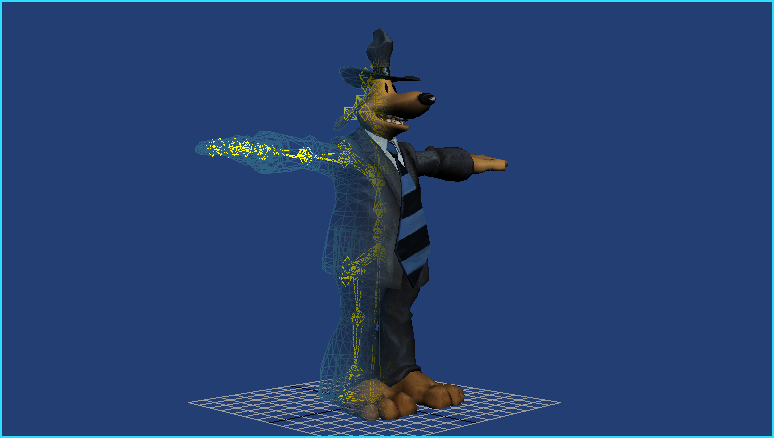 This bundle of scripts for 3DS Max will import the models from the majority of games that Telltale Games developed, with the original bone structures and rigging information (which by the way was no fun to fix up). All because of compressed vertex/face buffers. Blame Telltale. You'll need both the *.D3DMesh and *.SKL files, which should be in the same folder. Most of the earlier games will import with the textures pre-applied if you have the *.DDS files in a "Textures" subfolder, newer games won't due to material hashes that I've yet to figure out. Bone names in the newer games are hashed the same way, but I've added a list of "default" names to replace 'em where applicable. Use the QuickBMS scripts supplied to convert the D3DTX files to DDS, if necessary. Please let me know if there are problems importing any of the models using this script, and I'll do what I can to fix it! Last edited by RandomTBush on Sun Mar 17, 2019 4:45 pm, edited 59 times in total. Awesome job on this Question though, I have The Wolf Among Us but im not sure how to extract the ttarch2 files, how would i extract them? how did you get dds textures? I didn't get them yet actually, i've asked on the thread where ttarchext was posted. pepsiguy2 wrote: how did you get dds textures? I just spliced the data from the *.d3dtx into a DDS file and trimmed it to the proper resolutions. after or before the header? After. The largest mipmap is stored at the end of the file. I would advise using that one TextureFinder program to find the starting offset, if you've got it. I'm confused which part to cut from the d3dtx, ive tried texturefinder, found the correct texture and offset but the file apparently doesnt have that offset in hex editor. I'm thinking of something. Maybe I can set up like what chrrox had for the PSSG script, and locate/extract DDS files that way. I just gave up and started using Ninja Ripper/Texmod for the textures, lol. I've looked through the D3DTX files, and I've now added a button at the bottom of the pop-up which will allow you to convert the textures into DDS -- just re-download the script in the first post and use that. I know it works with (and will autodetect) DXT1, DXT5, and the greyscale-paletted images for the lines in The Wolf Among Us. Please inform me if you find a texture it doesn't work with -- I've only tested it with a handful of them! Thank you!! Ill test that out later, thanks for doing that!